I absolutely adore this quote. Firstly, it portrays a beautiful sentiment, with such simple and powerful words about giving back through community volunteerism. Secondly, it was said by none other than Muhammad Ali. And that matters to me, because, though he didn’t know it, I’ve spent many nights and weekends with Mr. Ali. You see, I was a daddy’s girl. I longed for time with my dad. Where he was … I wanted to be. Even if that meant doing the things he wanted to do; like watch, “the fights.” Yes, as a little girl growing up in the suburbs of northern California, I watched boxing on television – a LOT. I’m not so sure that I liked the blood and knockouts. What I did enjoy was sitting with my dad in the living room, pounding back a cold one (me – soda, him – probably Pabst Blue Ribbon or Schlitz), and listening to him talk about the fighters. His favorite was Muhammad Ali. We’d watch Ali dance around the ring with calculated precision, taunting his opponents with that self-assured confidence. All those years ago, I thought I was simply watching a boxer on television with my father. Turns out, I was watching the creation of a legacy who has transcended beyond athletics into a larger than life representation of service to our world. Muhammad Ali is an inspiration. 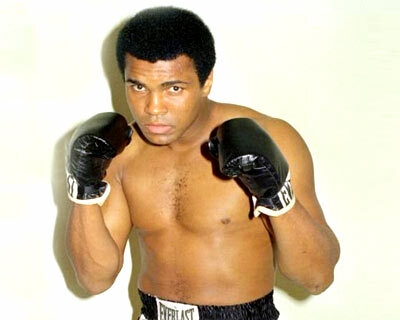 I’ve never been to his Ali Center in Louisville, Kentucky but I certainly admire the message, “Be Great :: Do Great Things.” What I especially love is Ali’s six core principles to inspire personal and global greatness – confidence, conviction, dedication, giving, respect, and spirituality. If I can be so bold, I would add a seventh principle to this list – “closeness.” The shear act of spending time with others to better our world through community service means we work together, building bonds and creating a sense of, “closeness.” For me, that closeness first came in the form of spending countless hours with my family volunteering through 4-H, a youth organization that develops citizenship, leadership and responsibility through experiential learning. 4-H quickly became the base for my love of volunteerism and community service. Both of my parents were active volunteers, and their service centered around the activities of their children. Through 4-H, my dad taught me how to train dogs as a project leader and my mom taught me about leadership and organization as our club’s community leader. As a family, along with our 4-H club, we sang Christmas carols to dialysis patients, sold cake and lemonade at our local county fair, and cleaned up parks. These service activities paired with time with my family, created a sense of community and familial “closeness” that has guided me into adulthood. My daughter wasn’t even out of the womb when I was back volunteering with 4-H in my late 20’s. Now, 19 years later, she has a full résumé of community service and volunteerism through 4-H, FOOD Share and her former high school’s Associated Student Body (ASB), among other organizations. Mostly, I think, my daughter has learned that giving of her time has created a sense of “closeness” for her with her community and family. I can only hope that she looks back on these times with fond memories and great stories that she will one day share with her children, as I have with her. And so, our family legacy of living Muhammad Ali’s core principles through volunteerism and service will be carried on. As I wrap up this blog entry, I revisit all of those moments spent with my dad, and I now realize that our shared experiences of providing service to others brought us closer together as a father and daughter. It gave us stories to talk about in between those boxing matches, NASCAR and NFL (I told you I was a daddy’s girl). In fact, when I describe my father to people, I often find myself saying, “He was my best friend.” In part, I have our community service and volunteerism to thank for that bond. Unfortunately, we lost my dad in 2001*, but the life lessons he taught me, especially about being actively involved in your children’s lives and teaching them about giving back to their communities, is something that continues to be who I am and will forever be part of my being. * NOTE: Lynnette’s father was a kidney patient, who lived over 25 years on and off dialysis machines and who survived three kidney transplants. He left an indelible impression on many who met him, teaching through example that a positive attitude and giving back to others can get you through so much in life. To gain a bit of insight about Richard Pereira, please take a moment to read the poem he wrote about living with kidney disease.